Hubbell-Wiring Style Line® Autoguard™ Tamper-resistant GFCI receptacle with LED indicator light, has open terminal design with nylon face and base construction for long-life durability. 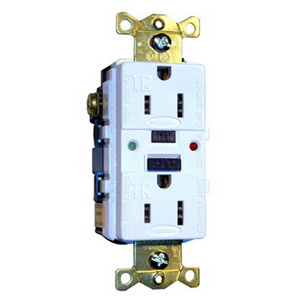 It 2-Pole, 3-Wire receptacle features ground fault indicator, zinc plated steel strap and brass contacts. The commercial grade receptacle operates at a voltage rating of 125-Volts AC, current rating of 15-Amps, temperature rating of -30 to 66 deg C and frequency rating of 60-Hz. It supports maximum load capacity of 1/2 HP. It avoids improper access to energized contacts. An open circuit condition eliminates false assumption of protection at face. It comes with an internal back wire. The black colored GFCI receptacle meets UL 943 Class A GFCIs and UL 498, NEC, CEC & OSHA. UL File E-41978 and CSA File LR-24886 standards.